Grandmaster Steve Lee Swift has 50 years of experience in the world of martial arts. He has dedicated himself to over 42 years of training in Wing Chun Kung Fu and 8 years in Okinawan Karate. Teaching and practicing Wing Chun is Grandmaster Swift’s sole profession. He is a member of the United States and International Martial Arts Hall of Fame and the World Head of Family Soke Council-ship Grandmasters Hall of Fame. 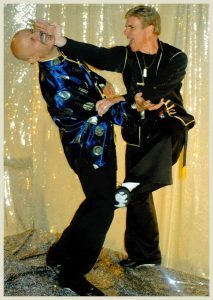 Grandmaster Swift provides extensive instruction in realistic combat training and the direct and effective techniques of Wing Chun Kung Fu. Grandmaster Swift traveled the world learning directly from the source: the sons of legendary Yip Man (Yip Ching and Yip Chun), Simon Lau, and even the renownedly known Wong Shun Leung. Grandmaster Swift has spent his life perfecting the art of Wing Chun Kung Fu. Beginners, instructors, and masters of all styles continue to seek out Grandmaster Swift. The effectiveness of Wing Chun in realistic combat is that of pure art. It takes combat into the world of chess allowing techniques to flow like that of a river without thought or conscious mind. It allows for the events of the moment to pass in almost slow motion letting the body perform what the mind has been taught. Grandmaster Swift first began boxing at age 4, his martial arts training in Okinawan Karate started at the age of 9, earning his black belt by the age of 13. For the next several years Grandmaster Swift participated in tournaments and taught his karate style through several different high school and college programs. At 17, he discovered there was something missing in the arts that he studied as a youth. The young, aggressive, and adept Steve Lee Swift would soon empty his cup and surrender all that he had learned to his true calling: the art of Wing Chun Kung Fu. Even as a child, with his family involved in traveling and helping the military issues of the world, survival was a grave necessity for him. Grandmaster Swift was in need of an art that would help him not only to stay alive, but an art that would help him against multiple opponents in close quarter combat. What the Grandmaster searched for was the fastest and most practical street form of street tactical self defense, he found it in Wing Chun: an extremely fast and practical art form, designed for life-saving purposes, with no tournament rules to follow. 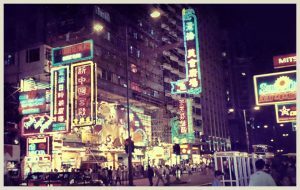 Immediately after graduating in 1977, Grandmaster Swift traveled back and forth from England to Hong Kong, to pursue the fullest extent of Wing Chun training. While overseas, Swift trained under Simon Lau, Yip Chun, Yip Ching, and Wong Shun Leung, and thus learned the complete Wing Chun system. Grandmaster Swift was the first United States citizen to be certified in Hong Kong as a senior instructor of the Ving Tsun Athletic Association, and has since owned and operated some of the largest Wing Chun schools in the world. In 1983, Grandmaster Swift founded the Steve Lee Swift International Martial Arts Academy, and began developing the necessary fundamentals to organize and administer the highest quality Wing Chun School in the world. Known as one of the world’s fastest and most knowledgeable Wing Chun artists of our time, Grandmaster Steve Lee Swift would then pass the art on with the heart and caring that it takes to teach the intricate style properly. It was Yip Man’s wish before he died that this be done. Through the true lineage of the direct sons of Yip Man, Swift made this possible being the first to bring them here to the states not once but four times. Yip Chun & Yip Ching resided with Grandmaster Steve Lee Swift and wife during their visits to the United States. 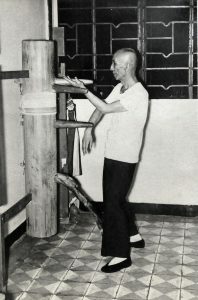 Grandmaster Steve Lee Swift was the first person to bring the Yip Man Family to the United States. Through the art of Wing Chun, Grandmaster Swift has taught many Chicago youth that a better way than failure is the way of success. It is certain that these students who trained closely with him hold the gift sacred that the Grandmaster has shared. Grandmaster Swift has been honored in 278 news and magazine articles on the Art of Wing Chun, including articles in the respected martial arts publications Inside Kung Fu and Black Belt Magazines. Several publications published articles about Grandmaster Steve Lee Swift when he saved the lives and health of multiple men and women who were the victims of assault. Thanks to Grandmaster Swift’s intervention, these individuals can still tell the story of their encounter today. Grandmaster Steve Lee Swift was the first Senior Instructor to be certified by the elders of the VING TSUN Athletic Association and the Yip Man Athletic Association He currently lives in Minnetonka, Minnesota and has schools in Minnetonka, Minnesota and Tampa, Florida. Grandmaster Swift continues extending the wish of his elders to pass on the art of Wing Chun to those with the heart and soul to learn. Here at Grandmasters Academy of Wing Chun Kung Fu, we are honored to represent the elite international organization of Grandmaster Steve Lee Swift.